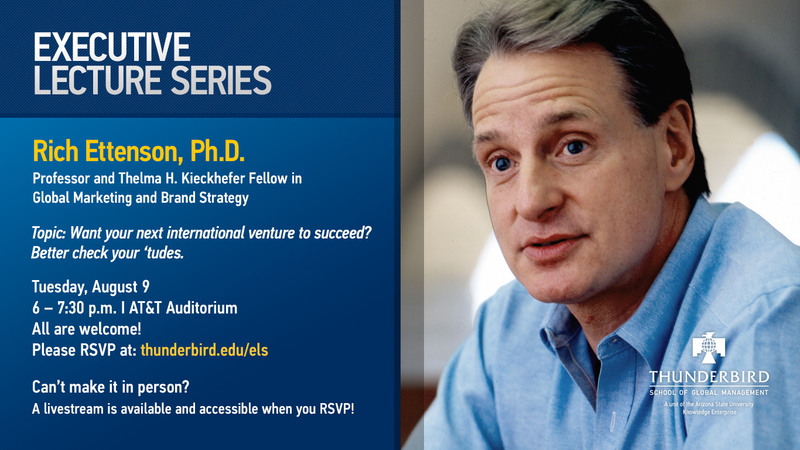 Last Event: Tuesday Aug. 9 6 p.m. - 7:30 p.m.
Executive Lecture Series: "Want your next international venture to succeed? Better check your ‘tudes"
One of the trickiest growth challenges companies face is to duplicate domestic business success in overseas markets. While some international expansion efforts are successful, we all know that far too many are not. At Thunderbird, we believe the rate of global business success can be improved. In this new and inspiring presentation, Thunderbird professor Richard Ettenson will present his latest thought leadership research (just published in Harvard Business Review [Digital Article]) aimed at helping executives and companies improve their chances of overseas success.